Sheri Fink's Pulitzer-prize winning novel is a great telling of the storm and its after effects. She focuses on Memorial Medical Center, a turn of the 20th century hospital that had weathered many storms. Neighbors took refuge in its solid corridors bringing pets and food to wait in community, However, this time was different, and this time was deadly. Accusations of mercy killings with elderly patients being euthinized began to circulate as the waters receded. Investigations were started and charges finally brought against a doctor and two nurses. 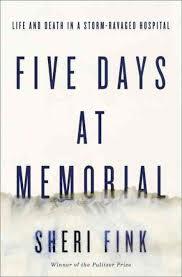 Fink tells a nuanced tale that starts with a history of the hospital and delves into detailed and multiple accounts of the five days doctors, nurses, patients and neighbors were stranded at the facility. The second half of the book focuses on the investigation and the determination of whether a crime was committed. Would an indictment help heal a community or aggravate open wounds? Sheri Fink is former relief worker in disaster and conflict zones, Fink received her M.D. and Ph.D. from Stanford University. The story of Memorial Medical first appeared in The New York TImes magazine. Many women I know have read Pride and Prejudice over and over again. The clever girl enticing the class-bound gentleman and the circumstances of being a woman in any age have held sway for millions of readers for decades. Jo Baker has bravely taken up the Bennet story centering on the lives of the small servant group that serves the family. The timing is the same as Austen's masterpiece, so we are treated to glimpses of the Bennet girls' courtship. But the focus is on a young girl who serves as Elizabeth's maid. Her limited options, since she was born an orphan, are balanced by the memories she had of a family before she was rescued by the head cook from the orphanage. There is enough romance and reality to engage most ardent Austen fans. The limited resources of the Bennet's give Baker an opportunity to explore the whole household as the staff plays many roles. She also adds gritty details that bring to life the times and the more personal chores the servants had to perform. To imagine the intimate dance the classes play is fascinating human play without the varnished sheen of a "Downtown Abbey." Jo Baker studied English literature at Oxford, but was not inspired to write full-time until moving to Ireland in the mid-1990s. Her first book Offcomer was published in 2002. "This is a start-to-finish field guide to creating your own domestic sanctuary," is how the editors of Remodelista describe this hardcover companion to their widely successful blog. With a forward by Juliane Moore, the book is a montage of some of the best looking homes you'll want to emulate. The "manual" is a great resource and would make a fine gift this holiday. It features "Twelve Houses We Love" (and why they work) with approachable and easy ideas. There are resources and design secrets -- really it's restful just to look at the pictures. They also do some heavy lifting on illuminating the small details and how to find and apply them that can make all the difference in a great home. Remodelista.com was started by four women with a similar sensibility and curiosity on how to bring an elegant touch to your home without breaking the bank. And do yourself a favor and add the website to your bookmarks. Moore does--for education and entertainment. What's not to love! How do you recommend a book that touched you so personally that you recoil from the exposure the review will bring? Such is the time of life when you see the emotional wounds of childhood resonate in yourself and those around you. Donna Tartt's book The Goldfinch is her most fully rounded work. The Secret History, her debut, which was talk of the publishing world, was well written but after all the build up never really satisfied. I can't really recall the plot of The Little Friend. However, this story is the fulfillment of all that promise. The novel opens in Amsterdam with the hero, Theo Decker, holed up in a hotel room avoiding the law. We aren't privy to the crime and won't be for quite a while. From there, we go back to his childhood and the events that brought him to this point. A father leaving, a mother taken away in a very public tragedy, a life of benign neglect take its toll. Don't get me wrong, the novel is not heavy with sorrow. On the contrary, there are wonderfully imagined characters and heroes in the story anchor the plot and Theo Decker. The title refers to a rare painting that was a favorite of Theo's mother. They are viewing the picture at The Met when an explosion kills her. In the confusion following the attack he rescues the painting, and the course of his life is set. The book moves swiftly and is one of those that keep you reading well into the night This was my favorite book of the year, and one of the best things I've read in all long time. Donna Tartt grew up in Mississippi and attended the University of Mississippi. She then transferred to Bennington College where she encountered other soon to be well know writers including Bret Easton Ellis.